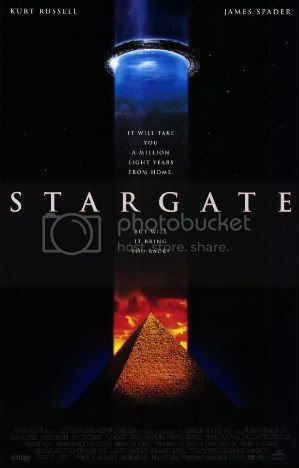 Nerdy Egyptologist Daniel Jackson (James Spader) is called upon to assist in a classified Air Force project near the great pyramid of Giza. The Feds suspect that a huge circular structure discovered near the pyramid is a "Stargate"--a teleportation device that links the earth with another site far off in the universe. Jackson deciphers the hieroglyphic code on the structure and, accompanied by a military team led by Colonel Jack O'Neil (Kurt Russell), embarks on a perilous journey to the unknown. They emerge into a bizarre desert civilization ruled by a Machiavellian tyrant (Jaye Davidson) who claims to be the sun god Ra. Cast includes Kurt Russell, James Spader, Alexis Cruz, Viveca Lindfors, Mili Avital, John Diehl, Jaye Davidson, Leon Rippy, Djimon Hounsou, Erick Avari and French Stewart.